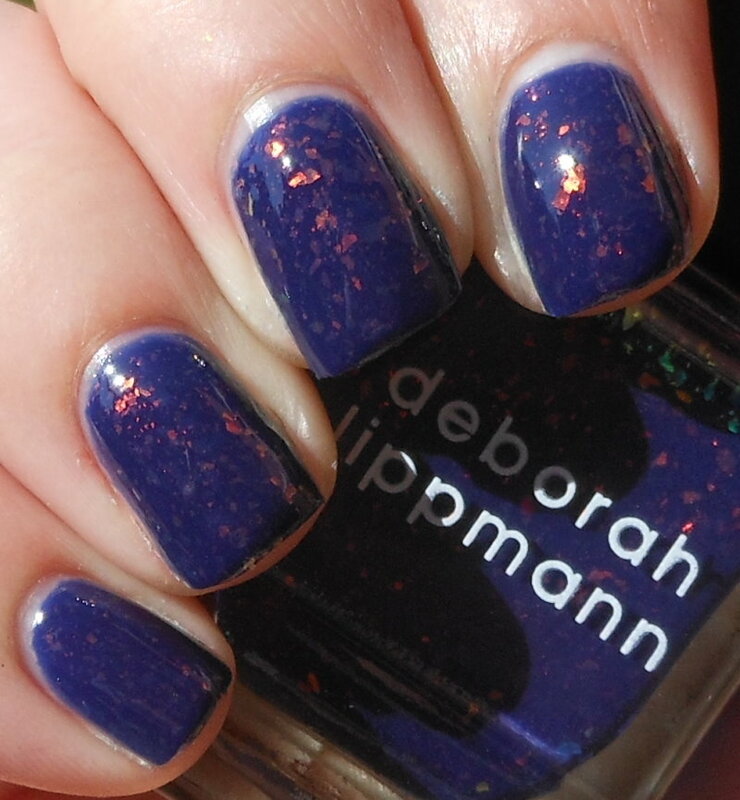 I remember seeing the Deborah Lippmann preview picture of her upcoming Spring/Summer 2012 polishes a few months ago. One of those polishes was a deep blue with what looked like copper flakies. It actually reminded me a lot of my dream polish idea I sent into RBL last year. I knew I needed it that instant, so I waiting patiently for that color to be released. 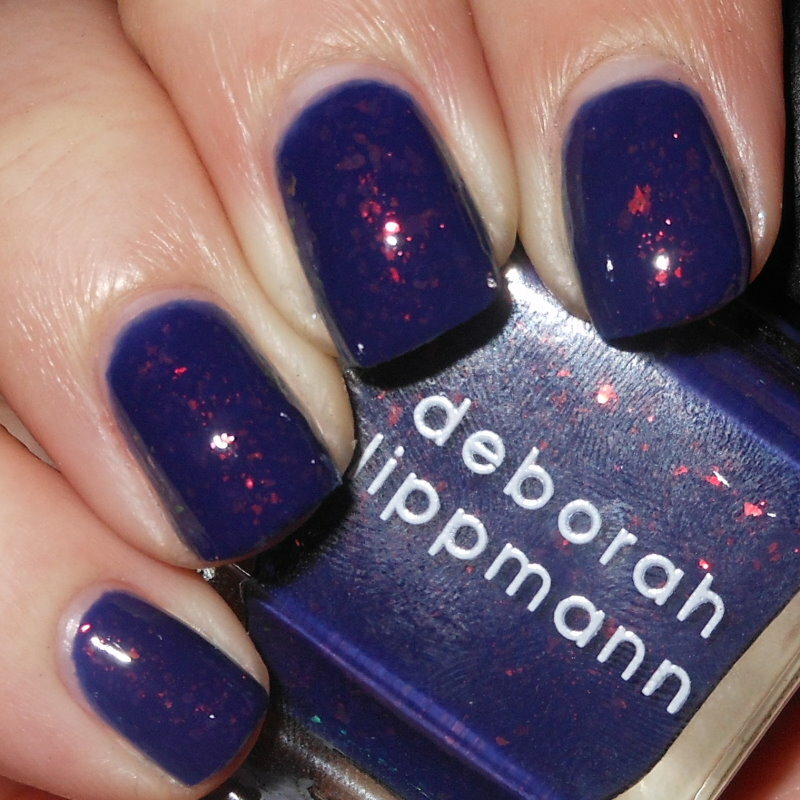 Thankfully, it was released last week on Deborah Lippmann's website (I no longer see it on there today. I'm guessing they sold out? ), and I snagged one. Ray of Light is a deep indigo jelly with pinky-copper flakies. When I got the bottle, in certain angles the flakies were iridescent that flashed yellow/green, however on the nail they did not. They just looked pinky-copper. This is a beautiful polish. It is really unique. I wish more polish companies would start pairing cool toned colors with copper and gold glitters, shimmers, and flakies. I will say I'm tad bit disappointed. In some of the bottle shots the flakies looked more like a straight up copper than this copper-pink. This is just me being picky though! I've wanted a mainstream color like this for so long! The formula also was problematic. I found it too thick. I added some thinner to it, but at $18, a problematic formula is not what I expect. Outside of that, I think this color really is a winner. I'm assuming this will be at Nordstroms soon and restocked on the Deborah Lippmann website...so keep an eye out! I have feeling this will be a popular color too. Don't take my word for it, but I wouldn't be surprised if we start seeing cheaper dupes come fall...just a thought! Oh! It's a little different than what I thought it'd be from the bottle shots too. I was definitely also envisioned straight up copper, in the form of micro flakes. The base is beautiful though! holy balls!!! this is amazing!!! i want to try & recreate this as a franken ;D i love it so much! I don't have any DL but I might have to break that after seeing this post, I realize I NEED this! I neeeed this. Like I need oxygen. Must have. Will, somehow. Did I mention that it looks fantastic on you? Yayy! Gorgeous! I literally just opened my package containing this 5 mins ago! Got mine from HSN.com, but I think it sold out there too! this is so pretty! me love this one! and this kind of deborah lippman that i would buy because it unique! Wow! I am usually not a fan of Lippmann polishes, but this just might be the first one I get. I love this! The color is gorgeous but the description doesn't sound like it's worth the money! Pretty! It's definitely close to your dream closet. One of the first swatches I've seen! I've been eyeing this ever since I saw the picture too. FYI, I got mine on HSN.com. It was close to being sold out though... don't know if it is now. :/ LOVELY! I am major in love with this shade. I have a large DL collection and this one is got to find it's way into my hands! Odd that it's a bit thick...maybe that's why it's not on the DL site - they pulled it to work on the formula. I don't normally have formula issues with DL - other than some of the sheers being streaky. Such a pretty color! I love the combo of the blue and the color of the flakies. really really gorgeous!! i haven't heard anything about this polish, nice catch! Gorgeous color! I love the flakes in the base. Oh you know what, now that I look again, I'm wrong... That color turned out different. This does in fact remind me of the one YOU created for submission to that contest! My bad! What I was thinking of was the vibrant blue powder and the copper wire in the pic for the inspiration of that Cuprum polish. This looks really pretty. Sorry you were disappointed. I agree, the formula should be heaven for that much money.